The original structure was named for Charles Roderick McCall, Professor of Languages at Troy Normal School from 1890 to 1898. It was constructed in 1960-1961 to house the various sciences. In 1999, the structure was renovated and enlarged to house the expanded mathematics and science programs. Location. 31° 47.96′ N, 85° 57.403′ W. Marker is in Troy, Alabama, in Pike County. Marker can be reached from University Avenue, on the right. Touch for map. Marker located in front of McCall Hall on the campus of Troy University. 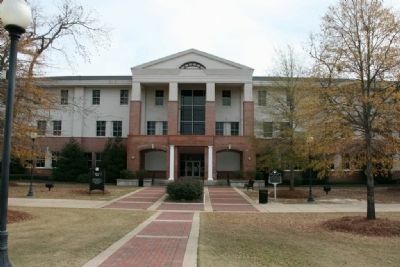 McCall Hall is located on the east side of the Trojan Fountain quad. Marker is in this post office area: Troy AL 36081, United States of America. Touch for directions. (about 500 feet away); Shackelford Hall (about 600 feet away); Pace Hall (about 600 feet away); “The Thinker” (about 700 feet away). Touch for a list and map of all markers in Troy. More. 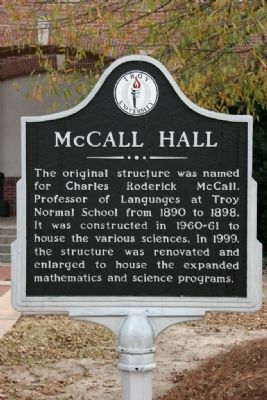 Search the internet for McCall Hall. Credits. This page was last revised on June 16, 2016. This page originally submitted on December 12, 2010, by Timothy Carr of Birmingham, Alabama. This page has been viewed 701 times since then and 5 times this year. Photos: 1, 2. submitted on December 12, 2010, by Timothy Carr of Birmingham, Alabama. • Bill Pfingsten was the editor who published this page.